Woof. I’m going to do my hair for one of these pictures eventually, I promise. 🙂 There is just NO energy these days! 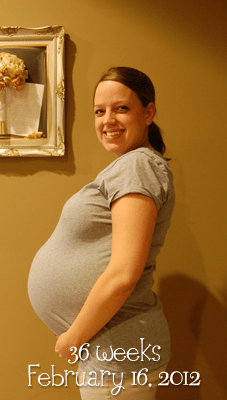 Size of Baby: According to Baby Center, about the size of a crenshaw melon? Around 18 1/2 inches and almost 6 pounds. Total Weight Gain/Loss: Up 23 pounds as of today. Maternity Clothes: Even the maternity stuff is a little snug. I’m having the hardest time with finding shirts that are long enough…I feel like my belly is hanging out the bottom! Stretch Marks: Besides the belly button scar, nothing! Labor Signs: I’ve had a lot of Braxton Hicks, and a few contractions that were just a little painful. They haven’t done hardly anything though…still 0 cm dilated and about 25% effaced. Movement: Still moving like crazy. We’ve had more activity in the mornings in the past few days, but that changes periodically. Sleep: Not great, not bad either…I wake up a few times to use the bathroom or change positions (which is a task in and of itself these days). What I miss: Moving/functioning…I have loved being pregnant, but moving at all is pretty uncomfortable these days! What I am looking forward to: Being done with maternity plans, and we have a shower this weekend and Tuesday! Cravings/Aversions: Just food…I’ve been really hungry. And thirsty! Best Moment This Week: Just making it through! As much as I’m ready to be done, I’d like to keep it up until my due date!